Australian Aerospace has handed over the last of the Army’s ARH Tiger helicopters, marking the end of a production run hit by several significant delays. 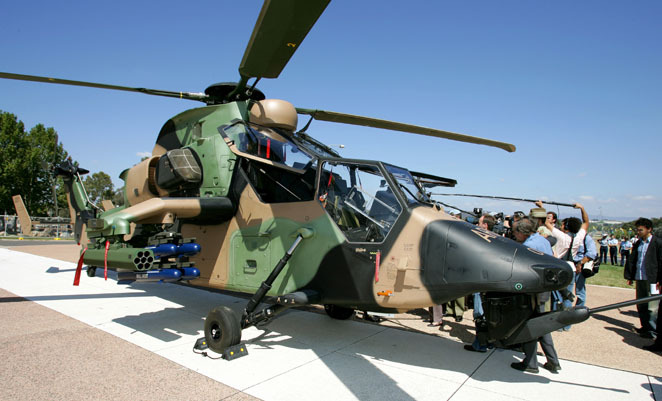 The Australian ARH development of the Eurocopter Tiger is configured as an armed reconnaissance platform carrying a 30mm nose-mounted cannon, 70mm rockets and Hellfire air-to-ground missiles. Defence ordered 22 Tigers in 2001 under Project Air 87, and is using the aircraft to replace its Bell 206B-1 Kiowas and (the since retired) UH-1H Iroquois gunship capability. Most of the Tigers are assigned to the 1st Aviation Regiment in Darwin. French Army Tigers have seen extensive service in Afghanistan since 2009 and in Libya this year. Production of the Australian aircraft was marred by several setbacks. Defence suspended payments for the project in 2007 due to a series of delays largely blamed on the Franco-German Tiger program. Payments resumed a year later. The program also faced controversy in 2010 after media reports quoted Defence sources saying the helicopter was not suitable for deployment to Afghanistan because it could not fly at night, due to issues with its lighting. Most of the Tigers were assembled at Australian Aerospace’s Brisbane facility. The company remains responsible for program management and through-life-support. Australian Aerospace is also producing Army’s MRH 90 Multi-Role Helicopter, which was placed on Defence’s projects of concern list this week.